The garden is finally beginning to produce , not in large amounts though, mostly raspberries. I've made quite a few sweet dishes with the raspberries - Raspberry Coconut Balls; and Raspberry Pavlova and even a Raw Raspberry Mousse Tart. and then there are the runner beans, dripping from the bean poles, the only vegetable not attacked by the birds and the slugs. I've made a couple of Runner Bean dishes (that I have yet to share on my blog), but one is made with Zaytoun Palestinian Za'atar. Za'atar is a zesty Middle Eastern seasoning made with wild thyme, toasted sesame seeds and sumac. I discovered Zaytoun when I lived in Glasgow and went along to a Fairtrade event. The Zaytoun extra virgin olive oil is like no other extra virgin olive oil that I have ever tasted, it was simply pure, flavourful and coated my crusty bread like melted butter. 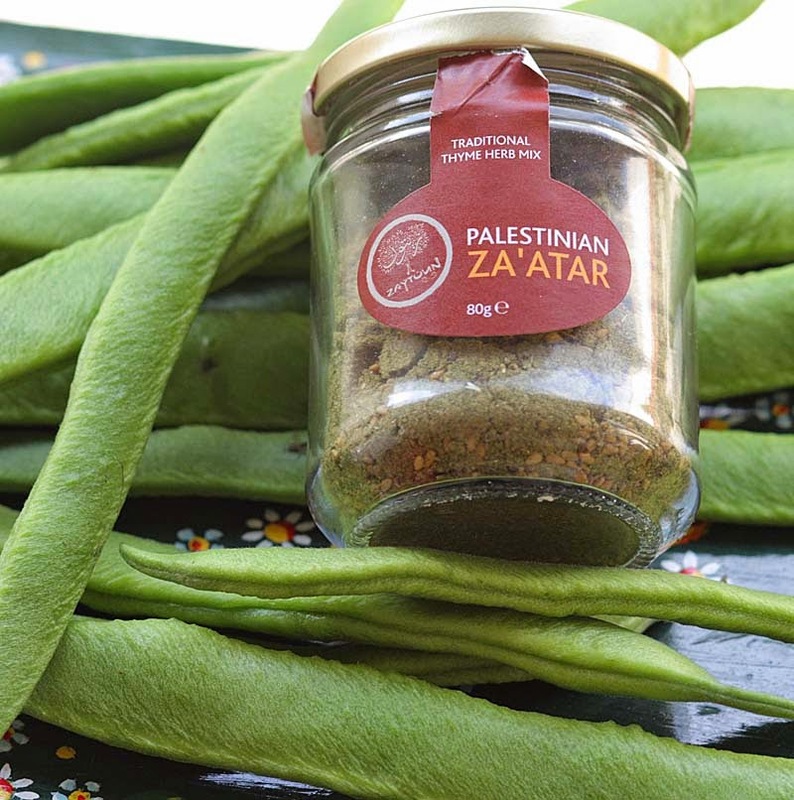 This particular jar of Zaytoun Palestinian Za'atar. got lost in the back of my kitchen cupboards and has only been rediscovered, it is now in the front and will be used actively in my kitchen. 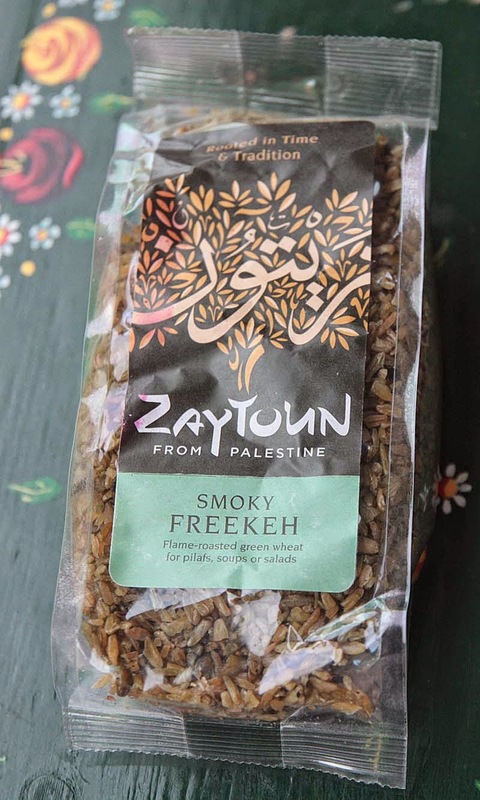 I also have some Zaytoun Smoky Freekah. I did cook with some last month, but the brand that I used was not overly smoky, so I thought I would try a different brand. Verdict to come. I have some Raw Beetroot and Rosemary Crackers, ready for me to tear open when I have the munchies. 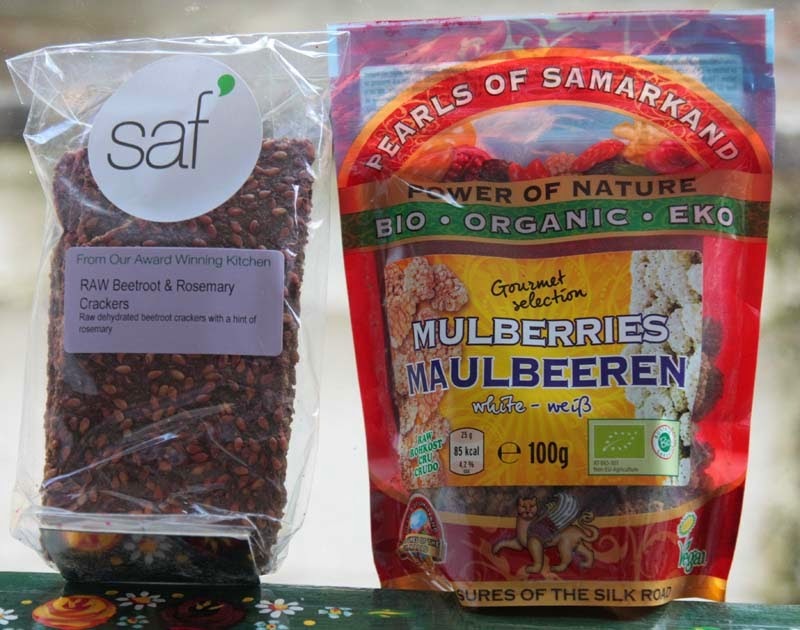 And some Pearls of Sarmarkand Mulberries. I tend to nibble on dried fruit when I want something a little sweet, but is anyone have any ideas what to do with them, other than stirring into breakfast - muesli or granola base, a recipe would be most appreciated. 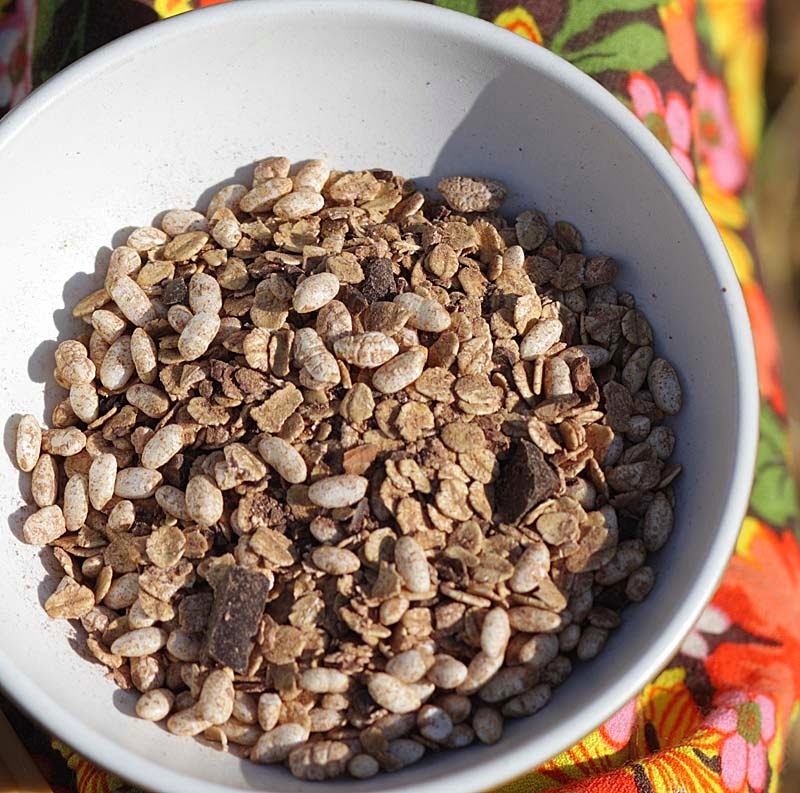 Raw Chocolate Muesli with Cacao Nibs and Cocoa Powder. Its utterly gorgeous to eat. I've also recently discovered a new brand of herbal teas CharBrew. 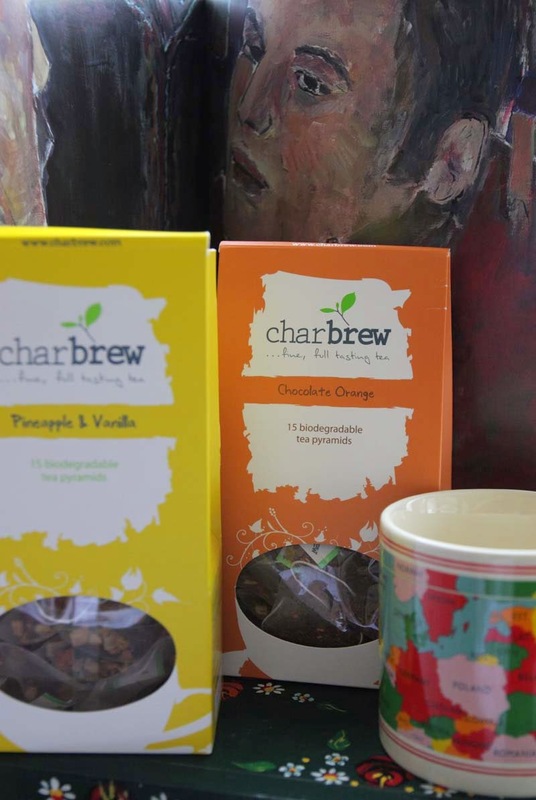 I have been making my own chocolate tea at home with cacao nibs (recipe to come), but to find Chocolate and Orange Tea excited me. I've had Chocolate Tea from a well known brand in the past and was really disappointed in it, as the next packet I purchased lacked chocolate flavour, and so did the one after that, so I have not bothered with that brand again, so you can imagine how pleased I was to find this. I ripped open the packet and my face was immediately hit by the chocolate and orange smell. The taste did not disappoint either . The other is Pineapple and Vanilla. Next to the teas is one of my new mugs with map of the world on it. I have instructed my husband that this mug is specifically to be used for hot chocolate or herbal fruit teas - not coffee or black tea (or he will be in the naughty book, where I tell him off for an hour or so and then forget). And some of you I am a snacker. I love my savoury snacks with proper crunch. 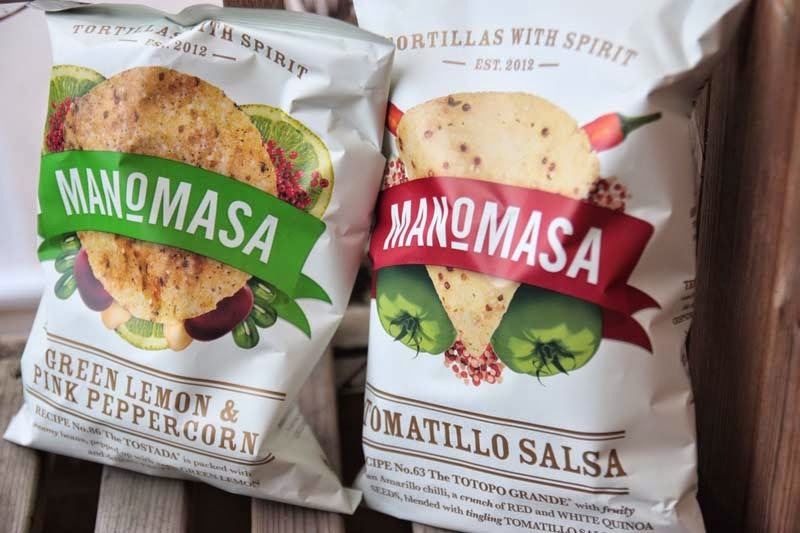 I was sent some Manomasa Mexican Tortilla chips to review. Not all there crisps are suitable for vegetarians, but some are such as the Green Lemon and Pink Peppercorns and Tomatillo Salsa here. I loved the sharp twang from the Green Lemon that danced on my tongue for a while, and the pink peppercorns was a lovely touch, nice change from black peppercorns. The Tomatillo Salsa had a wonderful balance of spices, but also heat and sweetness. I am looking forward to trying out there Chipotle Lime when I find a place that sells them locally, otherwise you can pick them up at Ocado and Independent Farm Shops. I've a few more things to share including unused kitchen gadgets rediscovered since I've moved home, but this new Optimuum 9400 Froothie blender has perhaps been the most used kitchen gadget in the last two months making smoothies, raw tarts, sweet desserts and sauces, so its only right that I write about it. I do have a designer brand Food Processor and Blender (both gifts), but the difference with this heavy duty Froothie machine is that is pulps, purees and chops and cuts through ice (creating slushies) and dried nuts very easily, whereas other brands you have to stop and start, scrape down, and start and stop again; or its a no go area, in fear of burning the motor out and I have done that in the past. I have found the Optimuum 9400 blender a pleasure to use. There are no detachable parts to screw or lock together, it pops on and off. It has been very easy to clean too, you just fill the jug with hot water from the tap and add a squirt of washing liquid, blend for a few seconds then tip and rinse out the contents. 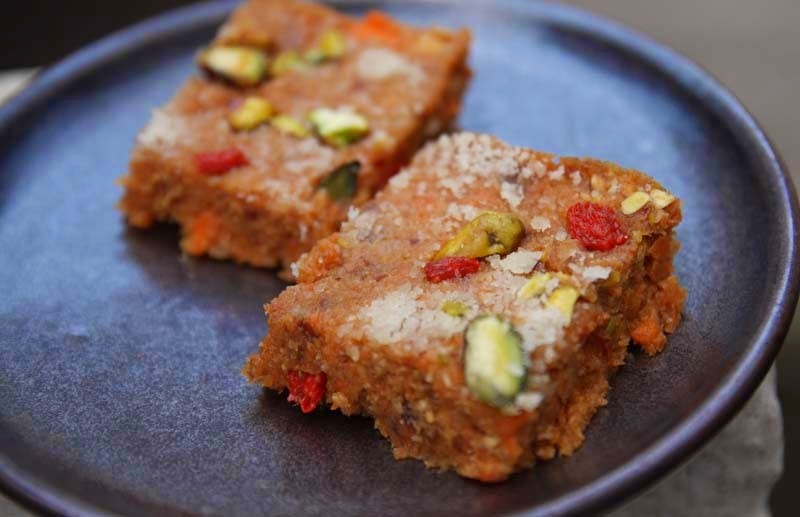 As I said, I have made lots of things in it, but the two that I am most chuffed about are Carrot Ketchup and Raw Carrot Halwa (recipe yet to be shared) which was a surprisingly big hit by every one who had a piece. I am sharing this post with Celia at Fig and Jam for August edition of In My Kitchen Series. Please go by and check out the other IMK posts for a nosy. Your food choices are so interesting! At age 59 I am just venturing out into the exciting foods in the grocery stores these days. Cooking with a variety of coconut products, almond milk, flax seed and meal, making my own condiments and new (to me) sauces. I'm enjoying your posts! Thank you so much Lynn. Its good to be adventurous with food whatever your age, never stop. I just love za-atar. Normally I use it simply, by rubbing it onto some olive oil brushed pita & then putting it under the broiler for a minute. Yum yum. Every once in a while I forget about it and then I (like you) see it in my cabinet with renewed interest. Its relatively new to me too, I've seen it many times but have hardly cooked with it. Hope you find some. You always have such interesting things in your kitchen. Love the sound of the freekeh, must look out for it. Lovely to hear from you Janice. When I lived in Glasgow, on Great Western Road there used to be a shop called Grassroots, should hopefully still be there - it was well stocked with this kind of grub, I think you should be able to find Freekeh there, if they are still about, ring and check. Interesting things you have there... We have an abundance of courgettes and helda beans (less stringy than runners, but fussier about the weather) this year, and our little fig tree even gave us 2 ripe figs to eat! There are more coming, but it looks like it won't be sunny long enopugh for them to ripen now. (Hope I'm wrong) Love the froothie blender- I too have broken machines trying to pulverise dates etc. so anything that can make date caramel would be a blessing in my kitchen! Thank you. I so do, now got to get cooking with them, not just staring at them. Oh shame that your fig tree only gave you two, the weather has been strange. We have had not fruit on our trees at all. I'd recommend the Froothie machine, just to let you know if your interested, if you purchase through my blog they will give me a little bonus, but its up to you - I know its not the most affordable around, but it is good. Your kitchen cupboard is full of unusual goodies, Shaheen! Thank you Mark, I hope to cook with them - not just admire them and then forget about them, like the za'atar. wow what a busy kitchen! Love it all but am excited by the smoky freekah and the chocolate tea as these are new to me and I live to eat smoky and chocolate. I have been into hot chocolate instead of herbal tea lately but will look forward to your chocolate tea for the best of both worlds. Hope to open the packet of Freekeh in the next couple of weeks. PS I've been drinking hot choc too, not cos its cold, but more for comfort. I saw your Choc scones post and yes, must admit its inspiration! 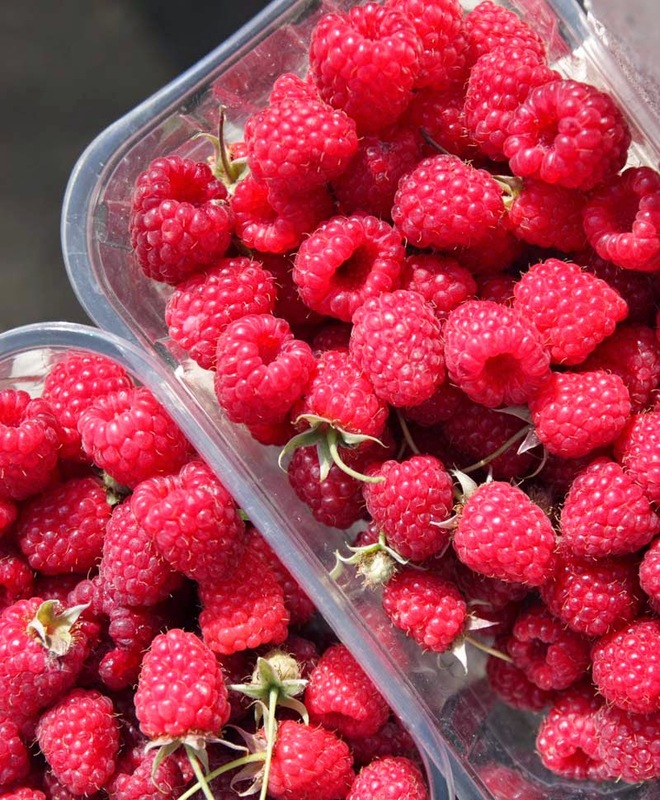 I can't tell you how happy my family would be if we could grow raspberries in the garden! And za'atar is a favourite here too - we smear it on pizzas and flatbreads. The chocolate and orange tea sounds intriguing - did it taste like tea, or more like a hot chocolate? Oh Celia, I would be so happy to swap, we have Summer raspberries at present and the Autumn ones will soon be here too, way too many for our garden plot. I may have to pull some out at the end of the season. I take on board you za'atar suggestion. The choc-tea tasted more like tea, you could add a dab of milk to it or cream I think, but I have only sampled one teabag so far. So many wonderful flavours in your kitchen this month. You've got some great things going on in your kitchen this month Shaheen and I LOVE the look of those raspberries! Thanks, loads of interesting goodies you've shared. Oh I love rasberries, but haven't had enough of them this summer. 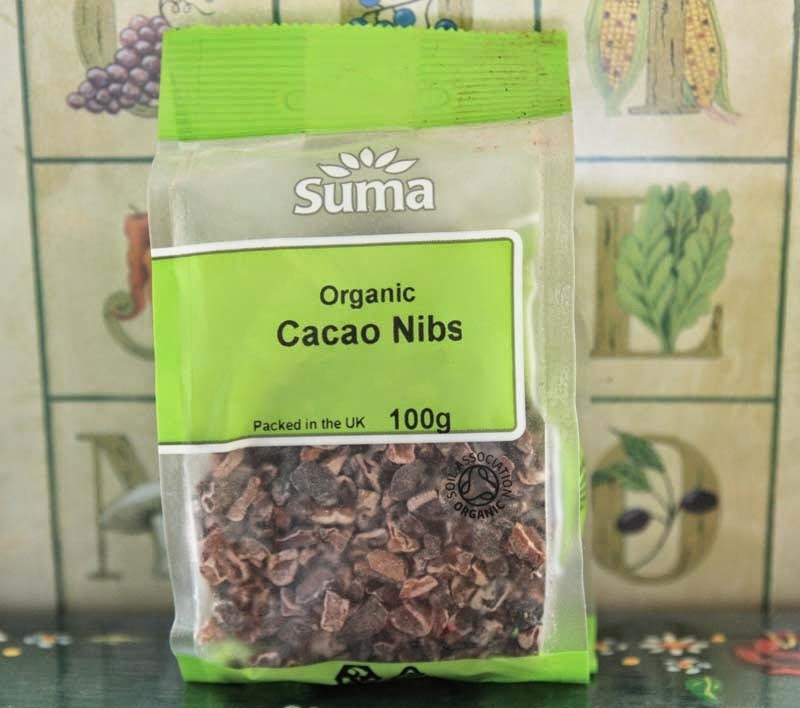 I have yet to try cacao nibs, but I think I should. You so should. I cannot believe that you have not had them, they are an acquired taste. I still have plums, if they turn out okay. Plenty of beans too. 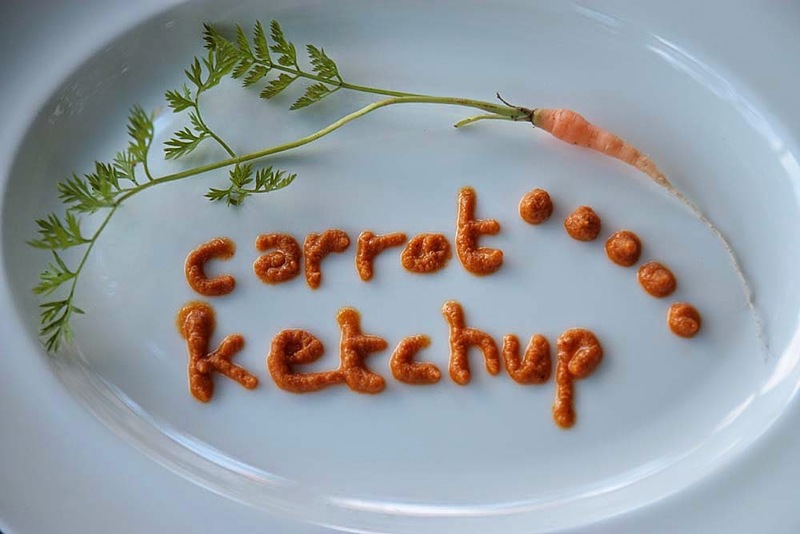 I hope you try the raw carrot ketchup it was good, I have also made a beetroot one, yet to share that on my blog - in the process of making your Broad Bean Cheese, will keep you posted on results.